This immaculately presented three bedroom, three bathroom home is located on a prestigious development in the popular traditional village of Tremithousa. 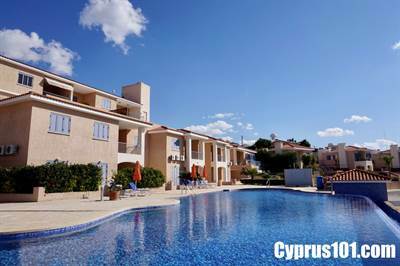 Local amenities are close by and Paphos town is only a 5 minute drive away. Magnificent panoramic sea views can be enjoyed from both the property and it’s unique, lower private pool terrace. The accommodation is spacious and pristine throughout with good quality finishes. The open plan living room features a cosy lounge, formal dining area and modern fully fitted kitchen. A large walk-in cupboard provides useful storage space. The washing machine is cleverly housed amongst built-in linen cupboards in an inner hallway leading to three double size bedrooms, all of which feature contemporary style, white fitted wardrobes. Two bedrooms have en-suite facilities and a separate family size bathroom is accessed directly from the hallway. Sliding patio doors in the living room and bedrooms allow easy access to the outdoor terraces located to the front and side of the property. To the front is a covered patio with extendable sun awning for additional shade – ideal for outdoor dining and enjoying the stunning coastal views. To the side is a secluded, private terrace, a perfect spot for relaxing and enjoying your morning coffee. Steps lead down to an impressive, mosaic finish infinity pool and sunbathing terrace overlooking beautifully landscaped gardens and the amazing coastal views beyond. For those who enjoy a more challenging workout, the resort’s facilities include a large communal swimming pool which is situated close by. In summary, this property offers a luxury lifestyle with unique, stylish accommodation and superb private facilities in a peaceful village setting on the outskirts of Paphos. Equally suitable as a permanent or holiday home and with full title deeds, this property is certainly something very special. ← Previous Previous post: Townhouse For Sale in Peyia, Paphos Price Reduced!